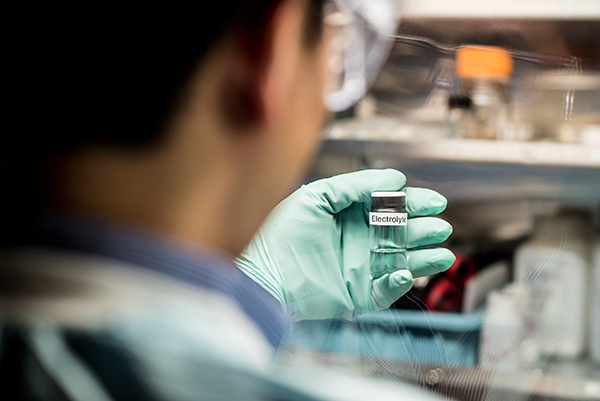 Researchers at PNNL developed a novel electrolyte for vehicle batteries that successfully creates a protective layer around electrodes — so they won't corrode -- achieving significantly increased charge/discharge cycles. Image courtesy of PNNL Enlarge Image. Adding more lithium-based salt to the liquid electrolyte mix creates a more stable interface between the electrolyte and the electrodes which, in turn, affects the life of the battery. But that high concentration of salt comes with distinct downsides - including the high cost of lithium salt. The high concentration also increases viscosity and lowers conductivity of the ions through the electrolyte. In this process, they were able to localize the high concentrations of lithium-based salt into "clusters" which are able to still form protective barriers on the electrode and prevent the growth of dendrites - microscopic, pin-like fibers - that cause rechargeable batteries to short circuit and limit their life span. 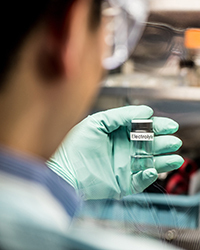 User Facility: Researchers performed microscopy and spectroscopy characterizations of battery materials at EMSL, the Environmental Molecular Sciences Laboratory, a DOE Office of Science user facility at PNNL.